Yes, I heard that quite a few times. Is it my fault that the rocks here look so much like pottery sherds I’ve seen elsewhere? Mobilization and Orientation. Forest Archaeologist Byron Loosle led a car caravan to the campsite, where we met the other volunteers, who had located the site on their own. After setting up camp and eating lunch, Christy Oprandy and Byron took the group to see a half dozen rockshelters to help decide which to excavate. I wasn’t sure what a rockshelter would look like, but I was thinking in terms of cliff dwellings. That would have made for some difficult work. Fortunately, all the rockshelters were at ground level. The terrain was more like rolling hills than steep cliffs; the shelters were rock outcroppings that protected narrow strips of earth. Getting to Work. 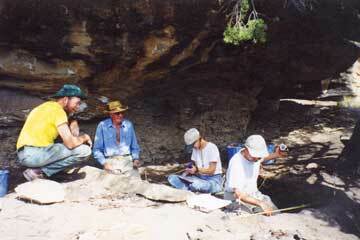 On the second day, Byron set the group to work at a large rockshelter designated 42DC1211. The rock overhang extended maybe 15 feet at the deepest point. Average depth was about 8 feet, length was about 25 feet, and only at the outermost edge could you stand up straight. Sometimes I enjoy being short. We staked out a 1-by-9-meter trench. Tom (one of the volunteers) took charge of the sifting. Thank you, Tom! That’s a very dirty job. The rest of us (Dawn and Ed, Jim and Billie, Karen, Scott, Anne, Val, and I) started troweling, taking occasional breaks to help with the sifting. Among the artifacts found this day were a broken biface, an antler tool (awl? ), some stone flakes, and some pieces of bone. Scattered around the site were pieces of broken metates and manos left by looters. Sites and Sights. With very experienced volunteers now, Byron and Christy split the group into two teams on the third day. I stayed on Byron’s team at 42DC1211. It did not take long to reach bedrock here. I think the deepest we had to go was less than a foot. In addition to digging, we did some sketching and profiling. A burn area in Square 8 was measured and profiled. After lunch, Byron and Christy took us on a tour of Nine Mile and Cottonwood Canyons. This area is famous for its rock art, and we saw a lot of it. Other sights included granaries, the remains of an old military road, old stone and log buildings, and locations of historic significance. I used a lot of film that day. Back to Work. Byron’s team finished up 42DC1211 on Day 4. 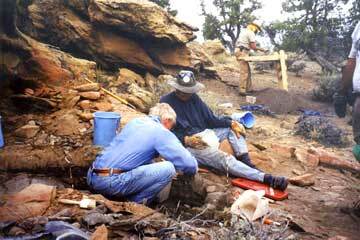 The work included the last of the excavating and sifting, sketching, photographing, and refilling the pits. We relocated to 42DC316 and started another excavation, but on a smaller scale, only a 1-by-2-meter pit. It didn’t take long to uncover an ash lens or hearth feature in the first pit, and another, and another—four altogether. Each needed to be drawn, bisected, and profiled—slow going, but still more interesting than just dirt and rocks. Christy’s team also finished their first site and started another one nearby. The evening was a mix of good and bad. The special meal that was supposed to be brought in never arrived. On the positive side, Ute Elder Clifford Duncan joined us and conducted a sort of informal seminar. He offered interpretations of some of the petroglyphs we had seen and related some Ute legends that figured into the rock art. Wrap-Up and Breakdown. Excavation was scheduled for only the morning of our fifth and final day. Back at 42DC316, some animal prints were found in Square 2. Out came the cameras to document these possible bear and mountain lion tracks. After considerable debate among the volunteers about what they were or weren’t, we called over Byron, who quickly solved the mystery. Leaning over the pit and putting his hand down for support, Byron’s hand perfectly filled the “bear” print. With his hand positioned a little differently, the “lion” print was also explained. After excavation had finished the day before, Byron had checked the squares right before leaving and did not realize that he was creating a mystery for us. Oh well, back to work. Two more hearth features were uncovered in Square 1 at 42DC316. Around midmorning, work paused so that group photos could be taken. The photos show everyone perched on rocks near the work site, with the PIT banner, a few trees, and a nearly cloudless deep blue sky in the background. Our fourth straight beautiful day. I knew there was no chance of rain, so I left the rain fly off my tent. An hour later, it rained and hailed. Not the usual 5-minute passing shower. The cloud just kind of hung over us for about an hour. We took shelter in the rockshelter (how original). When enough rain had fallen to illustrate what a “drip line” is, I found that I was straddling it. The rain lightened up, and we finished work with a light mist falling. The final sketches and measurements may be a little rough, but refilling the pits was not quite as dusty as it would have been. At camp, yes, there was a little water in my tent. 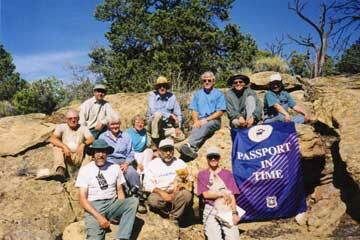 After we broke camp, our passports were stamped. Then Byron led us back to U.S. 40, where some of us turned right, toward Vernal, and others left, toward Duchesne. The weather-related confusion at the end prevented a formal closure meeting to discuss the project and its findings. However, I think that our work did demonstrate that undisturbed areas containing artifacts remained at all of the rockshelters despite the looting that had occurred. Other Recollections and Comments. We saw antelope and nighthawks. For a while, I was sure that a kind of snorting “brrrrrrrrrttttttt” noise was from an elk, and I was very skeptical when told it was from the nighthawks. Eventually, I did observe that when a nighthawk pulls out of a nosedive, the feathers on the wing tips vibrate and make noise. Being a lifelong city dweller, I don’t often see a really star-filled sky. The combination of remoteness, elevation, no clouds, and a late-rising moon made the best stargazing conditions I’ve ever seen. One extremely bright shooting star was visible across about one quarter of the sky. Finally, thank you to Byron and Christy for the education and to Christy for sharing her cooking utensils with me. Flying from Cleveland to Salt Lake City with a three-bag limit, I just didn’t have room for things like pots and pans. And thank you to all the other volunteers for their camaraderie and support in helping an underequipped camper survive in primitive conditions.